It’s not quite Halloween yet, but it’s only a little over two weeks away. And so keeping with the Halloween and holidays spirit (we just had Thanksgiving yesterday here in Canada) I thought it would be a good idea to have my mascot dressed for the occasion. I don’t normally dress up for Halloween but I thought I’d make an exception this year. Branding yourself and then playing with your brand can be a useful marketing tool that self-perpetuates itself. Think Google, and how they use stylize their logo on special occasions and anniversaries. They often commemorate unusual anniversaries such as the dates that famous scientists and inventors created something special. It’s all about your image and how you want people to think of your brand. In my case, I want to show that I don’t take things too seriously and like to have fun. There’s no monetary benefit for me having my special seasonal mascot made, it’s purely for fun and playing with my brand’s image. So what do you think? Gory enough for you? I love it. Now just don’t piss me off or else I’ll have to get some more blood added to my knife… BUHAHAHAHA! Ever since I had my mascot commissioned 2 years ago I’ve constantly had people ask me who designed it, even though it clearly says who in my Recommended Resources page and I have several posts like this one stating who did it. I don’t throw around such praise easily, so that’s really saying a lot. 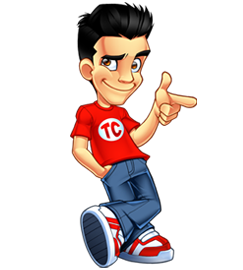 When it comes to custom cartoon/mascot work, Sergio is really one of the best in the world. He charges $600 per logo or mascot and while that may sound expensive, it’s really not. In fact, it’s quite cheap! First of all, you’ll be getting a world-class logo or mascot which you’re guaranteed to be happy with. I say guaranteed because he’ll provide you with early sketches and revisions along the way to make sure you’re happy with the way it’s taking shape. If not, he’ll do it until you are (unlimited revisions). Secondly, he’s pretty fast for what the quality of what you’re getting. While he’s been getting a steady stream of work lately (since more and more people are starting to find out about him), his turnaround time isn’t quite as fast as it used to be, but it’s still pretty fast considering the level of quality you’ll be receiving (1-2 weeks depending on what’s needed). Lastly, you’ll be provided with the PSD and any sources used in high resolution so that you can print offline material such as business cards, posters, or T-Shirts with your mascot or logo. I can personally say that the my mascot has easily paid for itself with the level of branding and awareness is has brought me. In fact, it’s almost too good, as I’ve had roughly a dozen people blatantly copy my mascot’s design… which is flattering, but also annoying! In addition to mascots and logos, Sergio also does illustration, web design, colouring, and print work. Sergio also runs a very high-quality blog at http://www.sosfactory.com/blog/. Designers love it as he provides free in-depth tutorials on how he designs. Just check out this post to see the quality and step-by-step detail of his tutorials. His portfolio speaks for itself and I’m sure you’ll agree that he really is one top-notch designer. Anyhow, I hope you enjoy “Halloween Tyler”! He’ll be up until November. That’s pretty cool. I’m hopping over to Sergio’s website now. Maybe once I sell a few good domain names I’ll be able to afford me my own mascot. SOS does amazing work. I actually have a mascot they created and sold which I hope to use in the future. I agree that they are one of the best in the world when it comes to mascots for sure! LOVE the Halloween mascot. SoS does insanely good work. How’d you find him in the first place? Great idea to have a Halloween logo. Small updates like this really keep a design fresh. I wish I had the extra cash to splurge on some graphic design services. It really makes a huge difference to get graphics professionally designed. This graphic artist looks very talented. For the level of work provided, his rates are not expensive at all. At the same time, it’s not something I will be able to afford anytime soon. The designer is a beast in the video. Looks nice I saw it this morning before the post went live. So im guessing your gonna look like the mascot for Halloween? Well, it ain’t gonna be like that for actual work for mascot creation. Real hard work. But it is sure worth it. Your Halloween mascot is really cool & looks real fun to me. They are all great logos but my favorite would have to be the superman logo. A little early for the holidays? Yeah it is a tad early, but I guess if you’re going to fork out money for a custom logo, you want it to get some use. It’s better than the Christmas graphics that are sometimes up as early as November. How much are the logos this guys is really talented? If you read the post, it states that the guy he used charges $600 per logo/design and will work on it until you are satisfied. I checked their price page, they charge $500-$600 for a mascot. Superb design! Yeah, no point in paying for something that you can get for free. I wish I had those kind of connections. Well, the only bad point is that everyone has their own style so I know it won’t look exactly like how SOS designs theirs which is hot. But also, I have to have patience and see how it works out at the end… but if I can save $500-$600 then that’s always a good thing. Is he sitting on it, or is it his time of the month? Of all the horror movies I’ve seen, I can’t say I recall any where the killer sits in the blood. Wow superb! SOSFactory really expert in this field, I’ve watched the video, really professional! I’ve checked out their price, a slightly expensive (perhaps for me only), I’ll consider to get one for myself in future, I love their design! I think the new logo is pretty cool Tyler, Scary.. but cool at the same time, thats the one thing I’ve always enjoyed about your blog.. when it comes to certain days… the Tyler guy will get dressed up for the event…. Just like around Christmas time, etc. Love the new Halloween logo Tyler. Sergio has a real talent, I may check out the tutorials he provides, but there’s no chance I can make anything like he has lol. Great looking logos, the guy definitely has got some talent, hopefully I can save up enough to afford him. The video was very cool! I thought you make your own mascot before, now I know where to get them. Your Halloween logo is awesome too, the knife and the bloody effect is very cool. I’ve used his blog before for tips on getting my line drawings really clean in photoshop, but I never realised he designed your mascot. I’m not the kind of person who believes in paying for something, and anyone who is reading and thinks they can’t afford him, why not use his site and learn to do your own? This guy is a fantastic designer and the video at the end was an awesome insight. 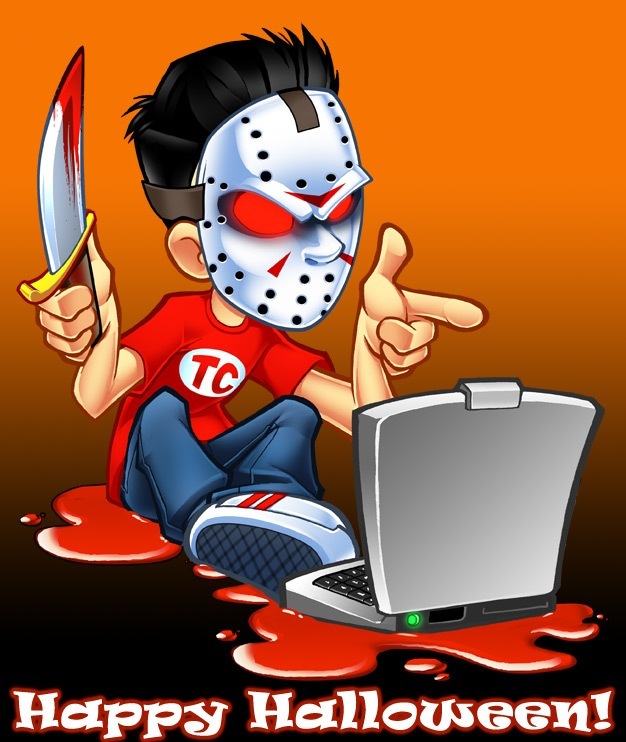 cool design its look like jason the 13th. tyler is a fantastic designer the video was very cool! I would of thought you were in your 20s.